Looking to learn how to use the best HDR editing software on the planet? In this video tutorial I show you how I go about retouching a city street after dark, creating image radiance and how to bring out details that helps create an amazing photo. In this tutorial I show you the secrets to understanding and mastering Tone Curves in your photo and video editing. So if you are looking on how to use curves to create a cinematic look, a matt photo look or want to create that old Polaroid style photo you see in all those instagram images. This tutorial is for you. Well it will not be long until Luminar 2018 is released. This amazing photo editing software has normally only been available for MacOS users but has now found its way to the Windows operating system. 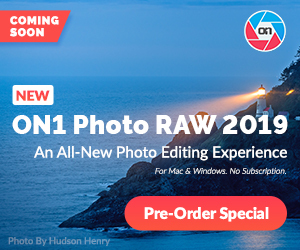 In addition Luminar 2018 comes with a plethora of new features professional photographers have been asking for. In this video I go over many of the features and demonstrate how they work and what effects you can get from them. So if you are sick of working with Adobe Lightroom, then Luminar 2018 Super Nova from Skylum software (formally known as MacPhun) may just been what your looking for. Working on my studio / office acoustics and video. Thought I would share what I have been up to today and see if anyone has any suggestions for mounting acoustic panels to the ceiling. Well I was looking to get a pair of new softboxes for my video lighting. What I ended up with is two of the Phottix Spartan Beauty Dish octagon style softboxes. These beauty dish styled softboxes can be converted from a traditional beauty dish to a standard softbox depending on your personal taste. They are also very quick and easy to setup. In this video we unbox the 28 inch (70cm) version to show you what you get and then I show you how quick and easy it is to assemble the Spartan Beauty Dish. So I just returned from Seoul South Korea from my photography trip and I have to say I am wore out. I got a good number of photos that I wanted to get and then some. I also picked up a new video camera the AXP-55 from Sony, the cousin to the AX-53. Hello Everyone. In this weeks Weekly Photo Blog I have a few things to cover and I share some personal details about my life. To start things off Macphun will have released Aurora HDR 2018 by the time this video goes live and I have a coupon code your can use to get $10 off your purchase by just watching the video. Canon is also scheduled to announce the Powershot G1X mark III by the middle of October and we have some rumored information on it. Plus it seems Adobe has already released a limited beta our of Lightroom 7 to select individuals with some performance improvements. Last things I wanted to talk about are the direction I will be taking the channel in, while pushing more creative photography ideas and as the title suggested, my health. Have you been wanting to learn how to focus stack your imaged in Adobe Photoshop, but have have been putting it off because you think it may be to complicated? In this video tutorial I show you how easy it is to focus bracket your images in Ps CC in a few easy simple steps. In this weeks photo blog I talk about the all new Polaroid One Step 2 instant film camera and Tamron has announced they have a new 100-400mm lens in the works, but it will not be available until the end of year? Aurora HDR is now also coming to the PC in their latest 2018. This amazing application developed by Macphun software has many of the tools photographers have been asking for. Regardless if your a professional or just a hobbyist who enjoys creating wonderful photos. Aurora HDR has you covered. Now even if you do not like bracketing photos or even if your a portrait photographer who finds your main photo application lacking. You can edit single image photos in Aurora HDR. In this hands on review I show you many of the tools and features you find in this software and show you how they work by retouching three images I took myself. Aurora HDR 2018 is now available for preorder. Get your copy today! In this video I go over many of the new and current features you will find in this software and why it is a must have even if your not into bracketing your photos. Canon has just announced a plethora of new gear. Four of which are lenses, a camera and a speedlite system for macro photography. The Canon EF 85mm f/1.4L IS USM, a 50mm, 900mm & 135mm Tilt Shift lenses with 1:2 Macro functionality and the new EOS M100 are sure to be very popular. The Nikon D850 has finally been officially announced. Nikon has been throwing out a good bit of hype about their new DSLR. But does it live up to their hype? In this video blog I talk about the Nikon D850 and ask my viewers what features they would like to see in the next version of Adobe Lightroom. In this Lightroom CC tutorial, I show how I retouched one of my recent photos from my Night Beats photo session. This is a low key color photo tutorial that I demonstrate how to use dodge and burning and how using clarity can bring out texture detail in your images. Weekly Photo Blog With Joe - 2017 Solar Eclipse Tips, Aurora HDR for Windows & No Nikon D850 Yet! The 2017 Solar Eclipse is quickly coming upon us. This event only occurs about 38 years or so for most people. So are you prepared? Are you looking for some tips to getting that once in a lifetime shot? Also it looks like MacPhun is close to releasing Aurora HDR for the PC, new version is said to have performance improvements, new features and even a new interface. Plus its coming for the Windows OS. Last topic, has anyone seen the Nikon D850 yet? It was rumored to be scheduled to be announced on Aug 16th, but no official word from Nikon as of the making of this video. More information has leaked on the all new Nikon D850 full frame DSLR. In this video we take a quick look at the rumored specifications and I give you my opinion on them. If you looking for an affordable shotgun microphone that sounds great, has many professional features and is built to last. Then the Saramonic SR-M3 Condenser Microphone may just be for you. This microphone can be mounted to your DSLR, Camcorder or mirror-less camera that has a 3.5mm mic jack and a open hot shoe. I have to say. After testing this mic out, it is now the recommended shotgun microphone that I will be suggesting to all my viewers and friends. More Nikon D850 specifications have come to light, so is this a revolutionary camera as Nikon claims? Or is it just a bunch of hype? Also looks like we found out why Adobe has been neglecting Lightroom so much and is Bowens forcing its employees into slavery? All this and more in this weeks photo blog. Want to improve the audio of your videos in Adobe Premier Pro CC? In this video tutorial I show you the steps I use to improve the audio of my pod casting / video blogging setup. This tutorial covers compression, limiting, echo removal, equalizer and hard limiter. Weekly Photo Blog With Joe - Canon 6D mk II Dynamic Range & Are Your Editing Your Photos Wrong? Seems there is never a perfect piece of gear for everyone. In this case of the just released Canon 6D mark II. It turns out it may not have improved dynamic range that we all hoped. But does this spell the end of the camera, or is just being blown out of proportion? Weekly Photo Blog With Joe - Bowens Is Dead, plus 7D mk III & 90D Coming Soon? After 94 years in business. Photography equipment giant Bowens is shutting down. Claiming china put them out of business. In this weeks Photo Blog I give you my opinion of why Bowens is dead, plus could the next Canon 7D mark III & 90D be just around the corner? Are you looking for a tutorial on how to get started retouching your video footage in Adobe Premier Pro CC? In this video I start you out with some basic indoor footage like many Youtubers would be using. I will show you have to quickly adjust white balance, basic adjustments, curves and standard sharpening. Well folks I have been at the whole YouTube things for just over 3 years now and I wanted to talk about that, the future of the channel and more. Canon has just announced the EOS SL2 DSLR camera. This compact DSLR has been updated with many new video features many vloggers are going to love and some still shooters will enjoy also. In this video I talk about the new features and also compare it to the SL1 as well as the 80D. Well the Canon EOS 6D mark II has been officially announced. Many are excited about this new camera, but seems there are just as many that are criticizing many of it features. In this video I wanted to talk about whats new & improved and clear up any misconceptions many consumers may be getting about this camera in regards to it and who this camera is actually marketed towards. The Tamron 18-400mm HLD lens was just announced today and we have leaked information and photos of the 24-70mm f/2.8 G2 lens that should be announced here within the next few days if not sooner. We have more information on the soon to be announced Canon EOS 6D mark II. Now this information I feel is solid, but there is always a chance it could be off. However I feel confident in the specifications that have been leaked. Also we have some leaked photos to help solidify many of the rumors. More rumors have came out on the Canon 6D mark II and since these look pretty solid I thought I would give my take on them. Rumor has it we will see an announcement on the 6D2 by June 29th, so I will continue to keep everyone up to date. Many of my viewers have asked about Luminar from Macphun since my last video and how it is different from Adobe Lightroom. In this video I give a quick overview of the features found in this photo editing software. Do keep in mind this is a beta and some of the features that the MacOS version have not been enabled yet. Hey everyone. I have some great news. Luminar from Macphun software is finally came to the Windows PC. Macphun has just announced their Beta testing program. So if your interested in trying out Luminar, hop on over to their website and sign up today..
Well Everyone, we just hit 10,000 subscribers. Another milestone for the channel. I wanted to make a video thanking everyone for subscribing, sharing and helping promote this channel. Its the community that has made this possible. So in this video I cover whats been going on with the channel the past few week and what to expect this summer. Are you looking for a budget and travel friendly lighting solution. Then I may have just what your looking for. I have put together a flash lighting solution that also uses a very compact softbox that can make those weekend trips to the park, camping or any other event where you want professional looking results, but do not want to drag everything out of the studio. In this video we talk about microphones. There are many different types and brands on the market and I do not own them all. But I do have a few types that many YouTubers and Podcasters may be using. So I try to explain a few types, their uses and what you can do to try to get the best quality sound from them. So two weeks ago I made the move back to a Windows PC from using Mac OS for the past 4 years. The biggest challenge was finding and learning new software that was similar that I had grown accustomed to on the Mac. In this video blog I talk about my experience making the move, what software I had to get and what I think about using Microsoft Windows 10 operating system. Are you wanting to customize your copy of Adobe Lightroom. Perhaps you want to show off your branding to your clients when they view your display. In this quick Lightroom CC tutorial I will show you how you can quickly customize your Identity Plate or change it out with a totally custom graphical one your created in Photoshop. Are you looking to add a creative touch to your portrait photography? Recently Kate Backdrop was kind enough to send me two of the photo backgrounds for a review. Made of polyester fabric I found them to be fantastic backgrounds. In this video I talk about the build quality of these backgrounds and also show some photos that I took to show off the creative potential these backdrops can add to your portraiture. If you are interested in these backdrops. Please help support this channel by using the Amazon affiliate link below. The Zoom H1 is a extremely popular and versatile audio recorder. Featuring XY stereo recording and both stereo line in and out. Makes it useful for many recording situations. In this product review I go over they key features that will appeal to most users and give my honest opinions on the Zoom H1 Handy Pocket Recorder.